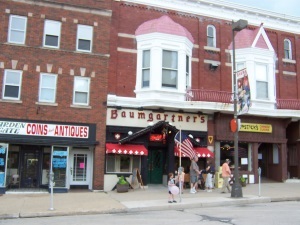 Baumgartner’s Cheese Store & Tavern in Monroe is a State Trunk Tour favorite! 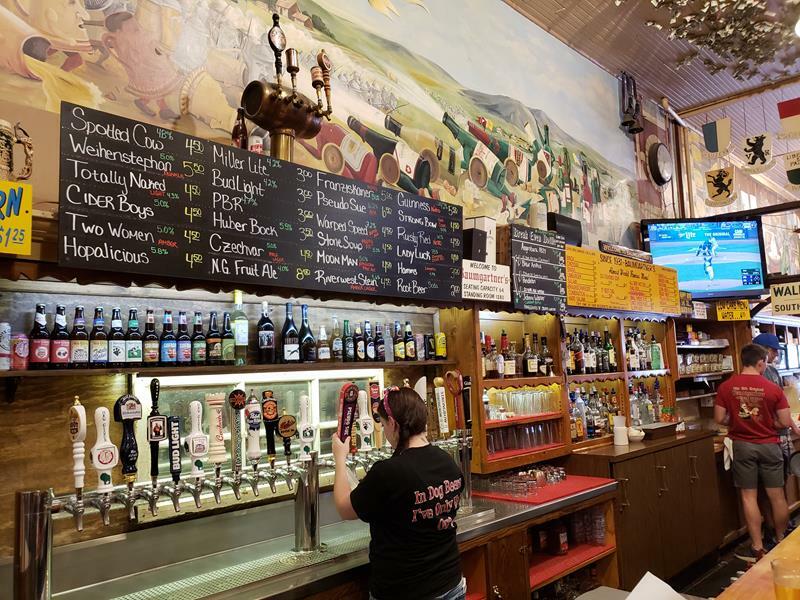 A cheese shop and tavern established in 1931, Baumgartner’s is a highlight of any road trip, serving up selections of cheese, sausage, beer, and some terrific fresh sandwiches. Our favorite is the brick cheese and summer sausage on rye, especially if you take advantage of their variety of mustards. 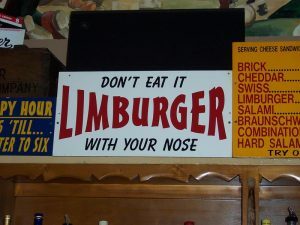 The house specialty is the limburger sandwich, featuring cheese direct from the only limburger cheesemaker in the United States: nearby Chalet Cheese Cooperative, which is only a few miles up the road. Not the best lighting, but it IS one of the best sandwiches. 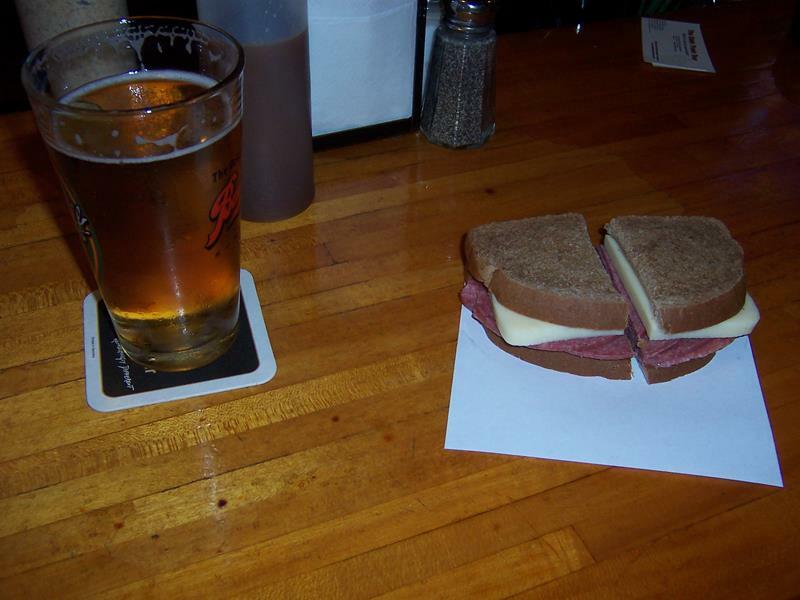 Summer Sausage & Brick on Rye at Baumgartner’s. The walls are adorned with murals, maps (check the pins indicating where people have visited from all over the world, especially Europe), and fascinating artwork while up top the ceiling is peppered with dollar bills, thrown up expertly by staff members who know how to incorporate a tack, a little weight, and a strong throw straight upward to help the donated bills stay there. About once a year, Baumgartner’s takes down the money and donates it to a different local charity. 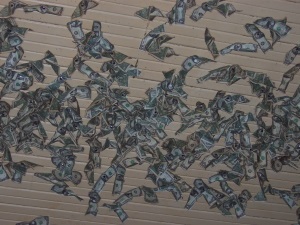 Dollar bills, embedded in the ceiling from skillful employees, hover over you in Baumgartner’s. Each year, the money is donated to a local charity. 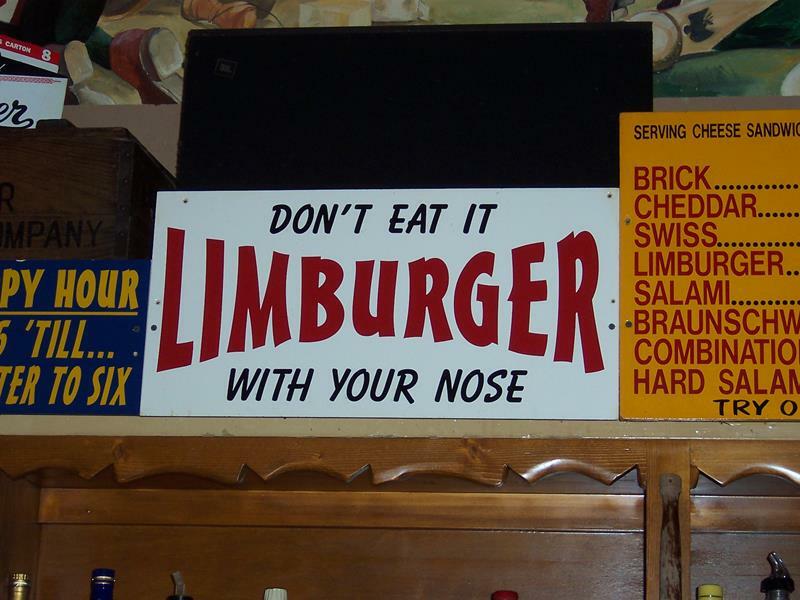 A festive atmosphere often permeates Baumgartner’s, as does the scent of Limburger cheese when a hearty soul orders it as part of a sandwich. They have a variety of foods to enjoy, cheese and sausage to buy, and people to meet, as this is a destination for many tourists from around the world. Check out where they’re all from on large national and world maps that adorn the south wall. Baumgartner’s is right on Monroe’s town square, which hugs the beautiful Green County Courthouse across the street. Minhas Brewery – and its new distillery and wine-tasting room – is just down the street. Highways 11, 59, 69, and 81 all bring you to Monroe and this tasty Wisconsin experience. 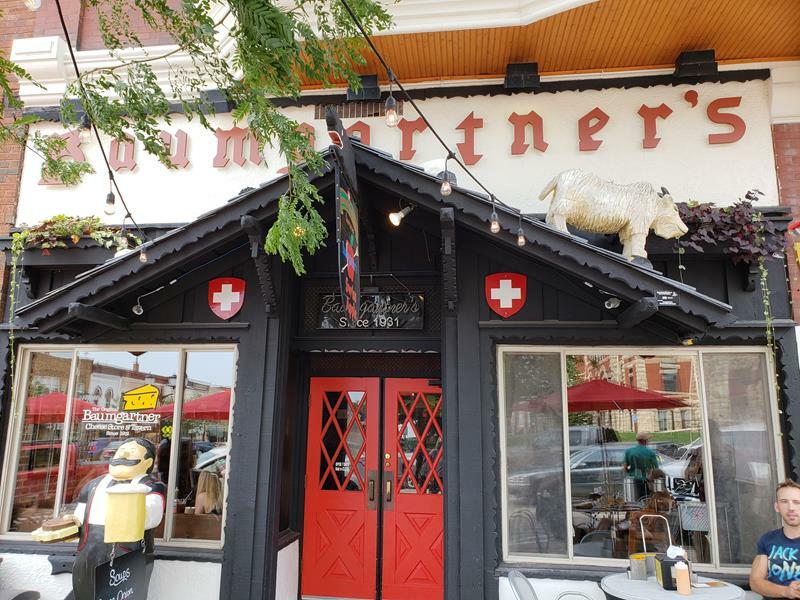 The front entrance to Baumgartner’s, a destination for cheese and sausage (and beer) fans from around the world.